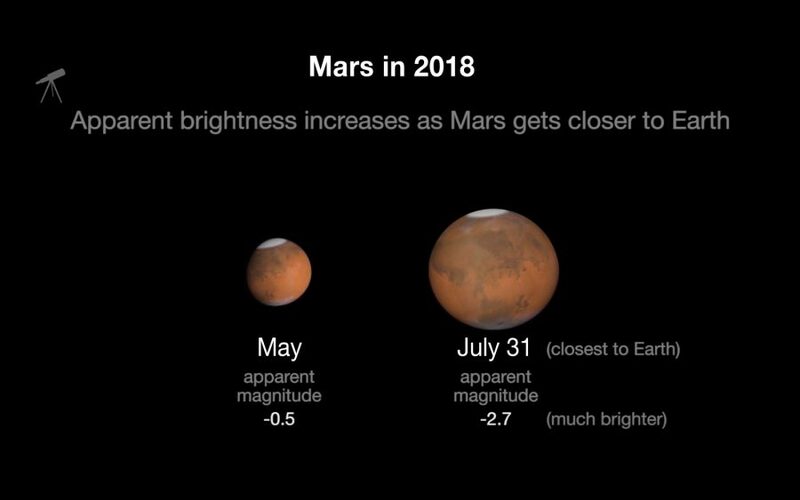 Mars is very close to Earth during July and August 2018 Mars ephemeris NB apparent diameter, 22July 24.0 arc sec up to 24.3 arc sec then back to 24 arc sec 8th Aug.
“A close approach of Mars provides an opportunity to send a space crew to Mars to support the existing Martian Colony which has been established for 5 years. Unfortunately the crew encounter mechanical difficulties and crash land 400km from the Colony before they can send a message to the base and with most of the equipment on board being damaged. Survival depends on reaching the Colony. NB: The Judges decision is final, any objectors will be transported to Mars. Participants can go into the draw to win a 25cm Dobsonian Telescope, 2nd and 3rd Prize a pair of Binoculars. The first drawn correct entries will win. Draw occurs at 5.30pm on 18th August. The telescope can be picked up from the Observatory and a session on how to use it will be provided or delivered to the winners address. Entries will be accepted from anywhere in Australia ( we would love you to visit sometime). Mars will be very close to the Earth over this period and viewing of Mars during it’s close approach through telescopes will be available. Disability access is available at the Federation – Adcock Telescope. Entries close 17th August 2018 Send by email to bas@cbl.com.au or drop in when you visit.